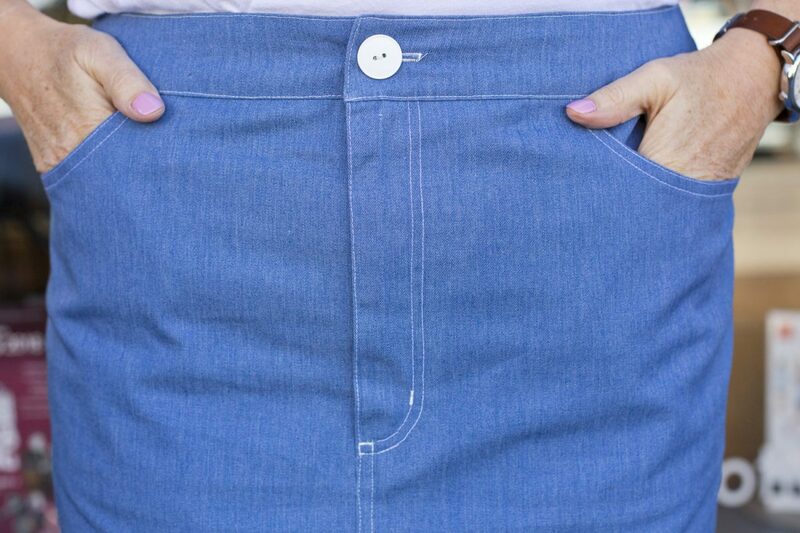 The white top stitching on my Clementine Skirt matches my favorite white tee perfectly! Merchant and Mills Clementine Skirt is a slim-fitting jeans skirt with a back slit, shaped waistband, and decorative top-stitching. Our shop seamstress, Bonnie, recently made the skirt for me. I love it! I always seem to have a denim skirt or two in my wardrobe, regardless of whether they’re in style. 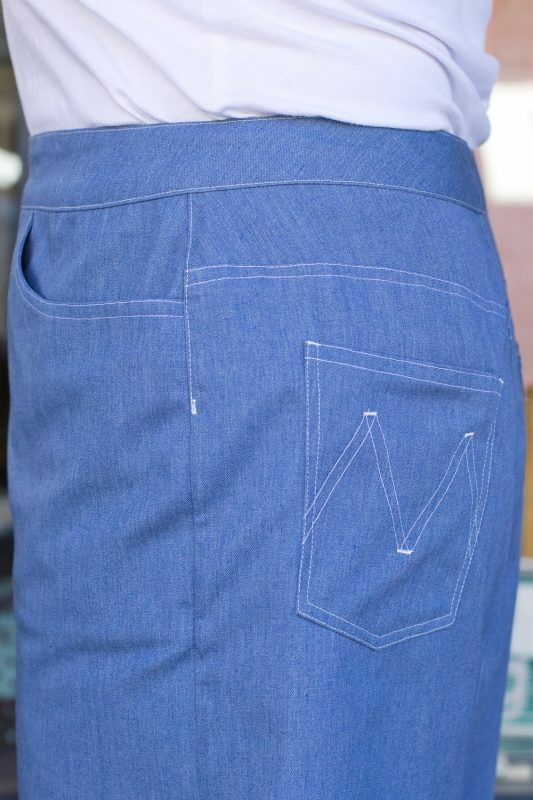 The Clementine is from Merchant and Mills’ new line of patterns, called “Made in Denim.” Of course, we decided to make it not in denim, but in our Eco Twill, which is 65% recycled polyester and 35% organic cotton. The polyester comes from Polyethylene Terephthalate (PET) bottles used for drinking and soda packaging. The fabric is gorgeous, but it does not drape or stretch at all. Even as the day goes by, the fabric holds its crispness. Do not even think about wearing this fabric at Thanksgiving dinner! The pattern is great for a crisp fabric, though. 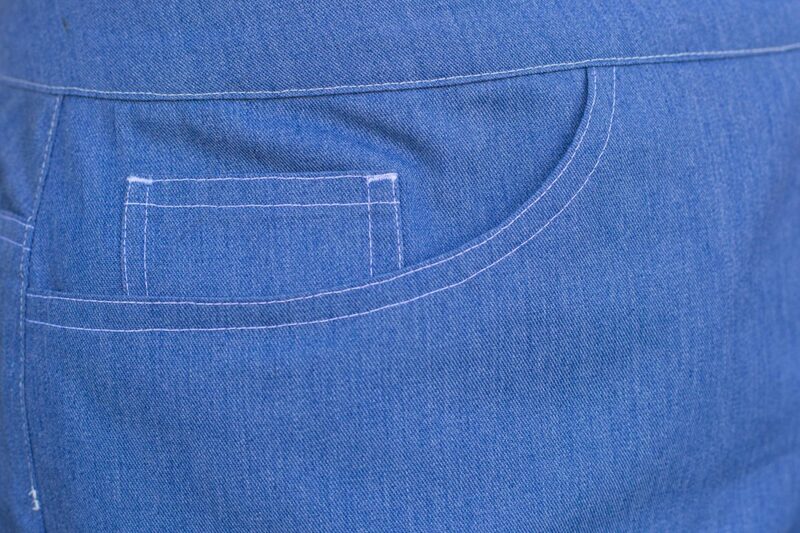 It has a shaped waistband, so you don’t have to rely on fabric stretch to make the waistband hug your shape. This skirt runs small, especially with a fabric that doesn’t relax or stretch at all. I’m a Merchant and Mills size 16 based on my measurements, but Bonnie made me a size 18 Clementine, and it fits perfectly. This entry was posted in Pattern Reviews, Skirts and tagged Clementine, Eco Twill, Merchant and Mills. 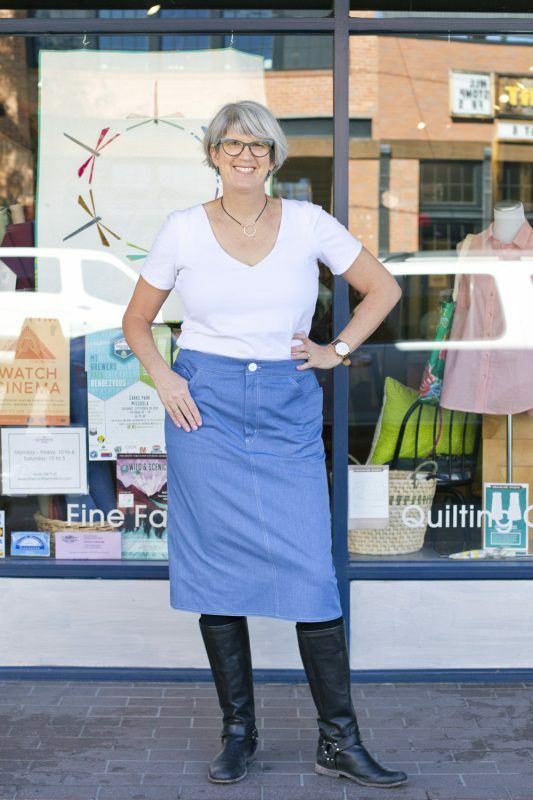 The Confident Stitch began as Kate McIvor’s blog to chronicle the pleasures of combining beautiful fabrics with custom-made patterns that curve with your body. She dreamed of providing the resources needed to transform great sewing ideas into outfits and projects. Now that dream has been made a reality, both with her store in Missoula, MT, and this website!